Sometimes I am just bewildered why Google hasn’t been pushing their development efforts in Google Reader as aggressively as Gmail. But, thanks to the developer community we can get some nifty features added to these webapps with browser extensions. We have looked at several Gmail and Google Reader Firefox extensions before. It’s time to look at an exciting Google Reader Chrome extension. You know how some websites still provide only a partial feed? It irks me to no end. 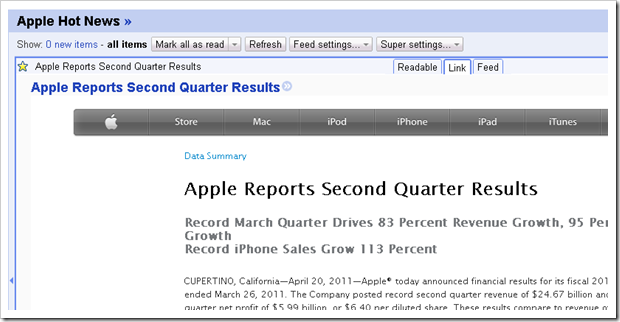 Super Google Reader Chrome extension enables full content for even partial feeds in your Google Reader. You may be familiar with Safari extensions like Readability that removes all extraneous information like ads, images, etc and presents the content in a very nicely formatted output. This extension uses Arc90’s readable service to give you the full content. If not, it can also pull the webpage in an iframe right within the Google Reader so you don’t have to leave your feed reader. Once installed, you will see these 3 options in the image in your feed item in Expanded or List views. Once you install the extension, just reload your Google Reader tab to start enjoying this new functionality. Check out some of the Minimalist Chrome extensions too.